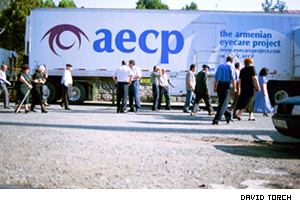 The Mobile Eye Hospital made its first mission to Ashtarak, where 5,000 were screened and 200 received surgeries and laser treatment free of charge. One person is getting a diagnosis, another is being examined, a third is being operated on and three others await their turn while a team of doctors rush into tiny rooms. It might be a common scene in a regular hospital. A remarkable thing happened here last week. You might have noticed that it was our one-year birthday, but that's not what I'm talking about. It has been said of many places, most famously New York City: "This is the city that never sleeps". Such a reputation usually comes because of a nightlife in which streets stay alive after dark, where clubs are open till dawn and tired shopkeepers stare from behind counters around the clock. If summer is traditionally play time for students who spend three months forgetting about school, it is something much different for teenagers trying to take the next step into university. "Documentarian", a film by Armenian director Harutyun Khachatryan won second place in the Documentary category of the 38th Karlovy Vary International Film Festival held in Czech Republic July 4-12. Drawn to Stay: Young Diaspora finding a home in "the homeland"
"There is some sort of magnet here. I believe it is the 3,000 year old history that continues to draw us to Armenia. No matter what reason brought you here, you end up discovering your roots." Defensive errors and a failure to convert their many chances into goals resulted in Pyunik crashing to a 0-2 defeat to Bulgaria's CSKA Sofia in Yerevan's Republican stadium. About 10 to 15 students sat outside the Presidential Residence in Yerevan Thursday to protest the closing of student hostels. They held banners saying "Think about future students" and "Mr. President are you with us?" The government is dismantling the student hostels, forcing non-resident students to find other housing.